For more than a decade, Joel Hallas, W1ZR, has been offering ideas and advice to radio amateurs in QST magazine’s “The Doctor is In” column. Each month he educates, dispenses cures for troublesome problems, and indulges in more than a little technical mythbusting. If you’re puzzling over how to improve your station antennas, or solve a problem with your antenna system, chances are someone else has shared the same questions with – and received helpful answers from – The Doctor. Having ARRL's Best of The Doctor is In at hand is the next best thing to a visit from W1ZR himself! 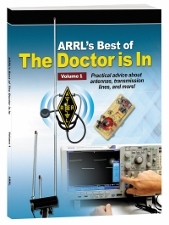 ARRL's Best of The Doctor is In. Kindle Edition. Publisher: The American Radio Relay League, Inc.